» What’s all that greenness cost? What’s all that greenness cost? Visitors at the Capitol, where only a minority worries about the cost of green policies. 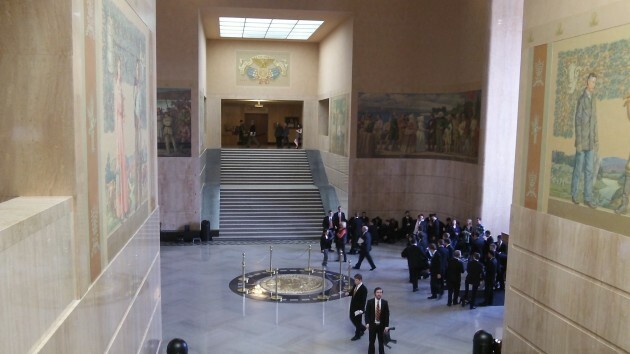 A handful of Oregon legislators think it would be nice to know what Oregon can expect to gain for all the money residents are being forced to pay to reduce so-called greenhouse gas emissions. A bill to find out will get a hearing Tuesday. But prudence is in the minority this session, so the bill will probably die. House Bill 4101 was introduced by Rep. Cliff Bentz of Ontario. Fellow Republicans Mike Nearman of Dallas, Gene Whisnant of Sunriver, Gail Whitsett of Klamath Falls, and Carl Wilson of Grants Pass signed on as cosponsors. Their bill would require the Environmental Quality Commission to figure out the “net benefits” of state programs and policies for reducing greenhouse gas emissions. Under this bill, the usual generalities would not do. Instead, measurements and approximate dates would be required. For example, the state would have to establish the estimated annual cost per resident resulting from any existing and proposed action to reduce emissions. The proposed program would have to inform us of how long it would take for the supposed environmental benefits of policies to be realized. In short, this approach would tell us how much we would have to pay for each program being sold with the promise of preventing climate change and when, as a result, we could expect to benefit from that cost. You can lead an ex-editor to science, but you can’t make him think. You can offer up a vapid response, but you can’t answer the question being asked.